The vote to raise the minimum wage and minimum compensation (wages, plus tips and employer’s contribution to health insurance) by Seattle’s city council is the most aggressive in a series of efforts to increase pay for traditionally low-wage workers. Congress shows no interest in changing the federal minimum wage, now $7.25 per hour, even to the $10.10 suggested by President Obama. But minimum wages rose in 13 states and several municipalities on Jan. 1, 2014, and in another four states at the midterm elections, either through cost of living adjustments or by legislative action. Some local decisions may disappoint—like the veto by the mayor of Washington, D.C., of an ordinance requiring big box retailers to pay a minimum wage of $12.50 per hour—but state and local government actions for better pay may prove advantageous in the short term. There are several reasons for this. First, local governments are better able to set a new minimum wage that reflects the cost of living in their area. Most would agree that it costs far more to live in a major coastal city like New York or San Francisco than in rural areas or even in many mid-sized cities and towns. The federal law lacks such finesse. Second, not all labor markets are the same. A city with a large population of retirees may offer different opportunities than a college town or an area where agriculture is the dominant industry. Third, local conditions can be more easily monitored as experience accumulates, and any needed adjustments can be made locally. Federal law is rarely so responsive. All of this is consistent with the principle of subsidiarity. Seattle’s law is novel in that it establishes two standards: a minimum wage, which is simply the amount of money in the employee’s pay divided by the number of hours worked, and a separate, higher minimum compensation, which is the total of wage income plus tips and the employer’s contribution toward the employee’s health insurance plan. The minimum compensation requirement, in practical terms, is apparently meant to assure that small employers or those with mainly part-time employees contribute something to an employee’s cost of buying health insurance individually. Another Seattle novelty is the requirement that any franchisee of a corporation that employs 500 or more employees in the United States is also subject to the wage requirements for large employers, even if the franchisee is a single store that employs far fewer workers. In other words, if it looks like a McDonald’s, it is a McDonald’s, even though it may be a family-owned business that would otherwise be subject to the reduced requirements of an employer with fewer than 500 workers. This provision stretches basic concepts of corporate identity and seems to deny the franchisee equal protection under the law by putting one family-owned restaurant or store at a major disadvantage compared with a similar but non-franchised, family-owned competitor in the same industry. But that is for lawyers and judges to settle. The new law sets big increases for low-wage workers. The minimum wage per hour for employers with more than 500 workers in the United States rises to $11 on Jan. 1, 2015, and then increases annually through Jan. 1, 2017, by set amounts to $15. Thereafter, the minimum is adjusted annually to keep current with the cost of living. For employers with 500 or fewer workers, the change is more gradual, starting at $10 per hour in 2015 and reaching $15 per hour in 2021. But the minimum compensation standard is $11 per hour in 2015 and rises by one dollar per hour annually to $14 in 2018. There are exemptions for salaried executive, administrative and professional employees, all of which terms are carefully described in the Washington State Minimum Wage Act. For reference, a worker who is paid $15 per hour for a 40-hour week receives $31,200 per year before taxes are deducted. That is equal to the poverty level income calculated by the U.S. Census Bureau for a family of six including four children under 18 in 2013. For a single-parent family of three with two children under 18, the poverty threshold was $18,769; for individuals, $12,119. What happens next? Minimum wage laws, like tax laws, are inherently experimental. They rarely produce only the predicted outcome. Side effects may be mild or severe. Maryland’s legislature, for example, recently raised the exemption in its estate tax only a few years after increasing the tax rate on “millionaire” estates. The higher exemption was approved by a Democratic-controlled legislature and signed by Governor Martin O’Malley, also a Democrat, because so many high-net-worth families were moving out of the state that the former tax increase was proving to be counterproductive. The new minimum wage law is not an undiluted blessing. Employees working 40 hours per week are indeed lifted out of poverty. But the Affordable Care Act’s requirement that employers provide health insurance coverage for those who work more than 30 hours per week may induce some employers to prefer part-time help. Part-time workers receive the Seattle-mandated higher pay, but only for the number of hours worked. Without a second part-time job, an escape from poverty may prove elusive for such workers. The combined employment impact of these two laws is difficult to predict. Earlier research by Neumark and Wascher had found that raising the minimum wage does result in fewer jobs available for the lowest-skilled workers as employers adjust. The effect may not be immediate, but becomes visible as time progresses, possibly a year or more after the wage increase is set. Technology or new procedures may cause some job loss. The economists also cite substantial evidence that the lowest-skilled workers may lose out to workers with slightly higher qualifications. An employer considering multiple applicants for a position that requires very little skill or training will still choose the worker with marginally better skills. When large minimum wage adjustments are made, as in the Seattle law, the higher wage may draw into the job market some people who had been ignoring entry-level jobs. Consider the middle-class grandmother, teenager or college student who is not interested in a job that pays $8 or $9 per hour but decides to go to work when the same low-stress, easy-training job pays $14 or $15 per hour. This “labor-labor” substitution hurts disadvantaged workers most. 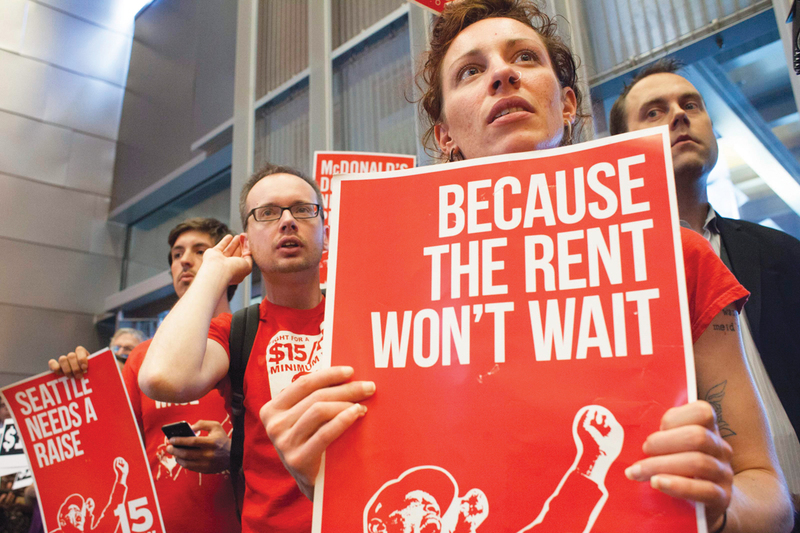 The stated purpose of the law is to help tens of thousands of Seattle workers escape poverty. The dignity of earning their own way is restored. Earned income replaces government assistance, and some people will move away from Supplemental Nutrition Assistance Program (more commonly known as food stamps) as their income surpasses the threshold for that program, which is 130 percent of the poverty line. If carefully managed, the higher pay will provide some discretionary income beyond basic living expenses, which can be saved (perhaps in a 401(k) plan), donated, spent on education or simply spent for one of life’s little luxuries. Some protest the law’s intrusion into free market establishment of wages. But the same protest would apply to the federal Earned Income Tax Credit, which has for years allowed Walmart and other businesses to pay poverty wages while paying shareholder dividends from multibillion dollar profits and paying executives multimillion dollar bonuses. How does any free-marketer argue that a business that cannot decently support its various stakeholders, including employees, merits a federal tax subsidy of its operations through E.I.T.C.? Nonprofit organizations may find difficulties, especially those that rely on revenue from federal programs. Robert Stack, president and chief executive officer of Community Options, a national nonprofit that provides services to people with severe developmental disabilities, wrote in a Wall Street Journal opinion piece (4/11/2014) that his agency would welcome an increase in the federal minimum wage—if the money could be found to pay it. His agency has a $100 million budget—a huge sum of money. But most of that revenue is derived from Medicaid billable hours since most of the clients are indigent. Almost every year, all of that $100 million is paid out in wages and other operating expenses. That is the point of a nonprofit: there is no profit. Unless Medicaid increases the rates it pays to service providers like Community Options, they have no way to pay the new minimum wage. The government sets those rates, not the nonprofit. Nonprofit entities are not exempt from the Seattle law or most other minimum wage laws. The squeeze is obvious. Unless Medicaid rates are adjusted, Community Options will have to reduce services in communities with high minimum wages. Other nonprofits face similar challenges. As more states and cities update their minimum wage laws, we can learn from both the successes and the failures. While the experiments are in progress, let us put aside our stereotypes and axioms to learn what works and what does not. That is essential. The experience, fairly measured, makes us better able to form, as Pope Francis calls for in “The Joy of the Gospel,” the “decisions, programs, mechanisms and processes specifically geared to a better distribution of income, the creation of sources of employment and an integral promotion of the poor” (No. 204). Some good observations. But please don't forget, those Walmart shareholder dividends you talk about go into teacher retirement accounts, IRA's of many working class Americans, and 401K's of workers all across our country. Please don't give the impression that the only people who benefit from those shareholder dividends are rich people. For many, many Americans, it's the shareholder distributions of huge corporations that cause the most growth in their retirement accounts. “How does any free-marketer argue that a business that cannot decently support its various stakeholders, including employees, merits a federal tax subsidy of its operations through E.I.T.C. ?” That’s easy to answer – a business should be able to designate a job as an entry level position that requires only a high school education, basic reading and writing abilities, and no special skills. Such a job would be suitable for a single young person just out of high school, still living at home, with no dependents and no special job skills. That there are people in this country who are 35 years old with no special skills and just a high school education, who have chosen to get married and have two or three kids and who still cannot balance their needs against their wants, and have to apply for such a job because it is the only job they are capable of doing is not the employer’s fault. I suppose all those condos in NYC which are selling for up to 100 million each are helping our 401ks. Or the fact that there is an astronomical change in the income between the 1 percent and the rest of us. The wealthy have always depended on Middle Class obedience to foster their excessive life style. Never more than today. is important to try things and evaluate them. That's how a good business does it. I take a little bit of an exception to your reaction to small, family owned corporate entities being treated like large corporations they franchise from. "But that is for lawyers and judges to settle." Let's call it what it is: Money taken from the middle-class and given to the "state" for re-distribution. It's bad law and has no business being codified anywhere. If it looks unfair, sounds unfair and frankly smells unfair, then it IS unfair. For any government entity to write something like that just to see if "it sticks" is immoral. My real problem comes in that I'm not entirely sure that we will ever know the true results. While not wishing to paint with too broad a brush, I do not have confidence in the reporting integrity at any governmental level. We can't even get an honest unemployment rate from the labor department or an true and honest assessment from the congressional budget office. The reporting agencies are as corrupt as the administrations and legislatures they work for. I don't expect much difference at the local level and certainly not from a progressively, liberal city administration like that in Seattle. I think we'll hear a whole bunch of double-talk and hear about lots of meetings to evaluate the numbers and then, after they have been massaged and skewed, we get to see them presented in such a way as to be favorable to those that passed the law in the first place. I'm sorry to be so cynical, but someone would be hard pressed to rationally dispute it. Let’s not forget the trillions spent on the “war on poverty” which has improved NOTHING (according to government statistics…go figure!!!) As for my fellow commenters, Bill, why don’t you talk to President and his Fed Chairman as they blow BILLIONS EACH MONTH into Wall Street and calling it “quantitative easing”? Gee after all those hundreds of billions being printed and thrown at them its a darn miracle that they’ve all done VERY well isn’t it?! Well said Gene Van Son. Mike Van Vranken also well said. This article also appeared in print, under the headline "Wage Watch," in the February 23, 2015 issue. Joseph J. Dunn is a retired business executive and the author of After One Hundred Years: Corporate Profits, Wealth, and American Society. He writes frequently on issues of economic justice.